The National Environment Agency (NEA) yesterday held one day consultative meeting for National Assembly Select Committee on the Environment on Institutional Capacity Building for the Implementation of Multi-lateral Environment Agreements (MEAs) held at Baoba Hotel. The one-day capacity building meeting was geared towards ensuring the implementation of such agreements like: the Stockholm, Rotterdam, Basel, Minamata Conventions and the Strategic Approach to International Chemicals Management (SAICM). Speaking at the gathering, NEA Executive Director, Momodou Jama Suwareh disclosed that chemicals are important determinants for sustainable development, sound environmental health and quality of life, “as we use them in all human activities including agriculture, health, energy production, manufacturing, services and residential that contributes to improving the quality of life.” However, he was quick to add that they also raise concerns about its harmful effects on workers, consumers, the environment and society at large through exposure. 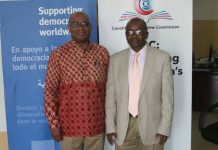 He said the Gambia government in partnership with United Nations Environment Program (UNEP), is implementing the important project as part of the implementation of the Stockholm Convention on Persistent Organic Pollutants (POPs), The Basel Convention on control of trans-boundary movement of hazardous wastes and their disposal, The Rotterdam Convention among others. 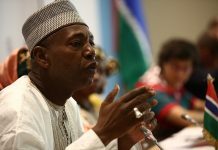 He said the Gambia has ratified all the aforementioned conventions with the ultimate aim of protecting human health and the environment, and has also recognized the need towards the development of an institutional framework for the sound management of chemicals and waste to enhance implementation at national level. To meet her obligations under these conventions, Mr. Suwareh continued, The Gambia had to prepare a project proposal and submitted it to the Special Programme Secretariat for funding, leading to the meeting with the NAMs. According to the NEA boss, the objective of the Special Programme is to support country-driven institutional strengthening at the national level, in the context of an integrated approach to address the financing of the sound management of chemicals and wastes, taking into account the national development strategies, plans and priorities of each country, to increase sustainable public institutional capacity for the sound management of chemicals and wastes throughout their life cycle. Some of the expected outcomes of institutional strengthening through the special project are to develop and monitor the implementation of national policies, strategies, programmes and legislation for the sound management of chemicals and wastes; promote the adoption, monitoring and enforcement of legislation and regulatory frameworks for the sound management of chemicals and wastes; promote the mainstreaming of the sound management of chemicals and wastes into national development plans, national budgets, policies, legislation and implementation frameworks at all levels, including addressing gaps and avoiding duplication. Suwareh therefore recognized the importance of the participation of NAMs in realizing the above outcomes in the consultative forum to gain deeper understanding of the chemical conventions since they impact on many sectors, including policy-making, law-making, environmental protection, and public health, industry and the private sector and various interest groups. He therefore called on the NAMs to influence and clout to play proactive roles in achieving the desired goals in environmental preservation. “I challenge all of us both individually and collectively to demonstrate our commitments towards meeting our national obligations in the implementation of the MEAs,” he concluded. The Chairman of the NAMs Select Committee on the Environment Hon. Sainey Touray commended the NEA for organizing such educative gathering for them at the crucial time of the year when many including farmers are busy dealing with these chemicals with a second thought of its negative impact on both the environment and people.